Investigation of a Citizen Above Suspicion (Italian: Indagine su un cittadino al di sopra di ogni sospetto) is a 1970 Italian crime drama film directed by Elio Petri. It is a dramatic, psychological, black-humored satire on corruption in high office, telling the story of a top police officer who kills his mistress, and then tests whether the police would charge him for this crime. He begins manipulating the investigation by planting obvious clues while the other police officers ignore them, either intentionally or not. A recently promoted police inspector (Gian Maria Volontè) kills his mistress (Florinda Bolkan), and then covers up his involvement in the crime. He insinuates himself into the investigation, planting clues to steer his subordinate officers toward a series of other suspects, including the woman's gay husband and a student radical. He then exonerates the other suspects and leads the investigators toward him, in order to prove that he is "above suspicion" and can get away with anything, even while being investigated. In the end, he confesses to the crime in front of his superiors - who refuse to believe him. Sure that he is safe, he recants his confession, and receives the approval of the police commissioner. 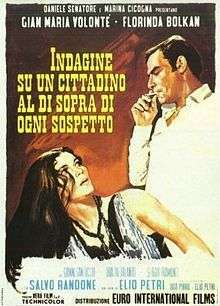 Investigation of a Citizen Above Suspicion was released in Italy on February 9, 1970 where it was distributed by Euro International Film. In Italy, the film had a domestic gross of 1,928,248,000 Italian lire. The film was highly regarded in its own time, winning the Academy Award for Best Foreign Language Film, and both the FIPRESCI Prize and the Grand Prize at the 1970 Cannes Film Festival. Also it won as Best Foreign Language Film at the Kansas City Film Critics Circle Awards 1971 and the Edgar Award from the Mystery Writers of America for Best Mystery Screenplay. Investigation of a Citizen Above Suspicion was well received by critics and is widely considered one of the best international films of the 1970s. The New York Times called the film "a suspense melodrama with the moral concerns of angry satire...When it opened in Italy early this year (and later, when it was shown at Cannes), Investigation was hailed for the ways in which it exposed the corrupt, authoritarian practices of the police, who place themselves above their own laws...The story moves forward with a relentless momentum. It is a political parable, and a stunning movie." Cannon Films had hoped to remake the film in the mid 80's with Sidney Lumet or Andrei Konchalovsky directing. Al Pacino and Christopher Walken were to star, and Paul Schrader as writer, as he wrote both a story treatment and a screenplay. 1 2 Curti 2013, p. 39. ↑ "Festival de Cannes: Investigation of a Citizen Above Suspicion". festival-cannes.com. Retrieved 2009-04-10. ↑ Canby, Vincent (1970-12-21). "Film: 'Investigation of a Citizen Above Suspicion':Suspense Melodrama Opens at Baronet". The New York Times.